Learn more about taekwondo training, its history, and how it can impact your life. With over 80 million trainees, taekwondo is the most popular martial art on earth. In fact, along with judo, it is among the only martial arts forms that are competitive events at the Olympics. However, taekwondo is more than just a martial arts form—it’s a way of life. 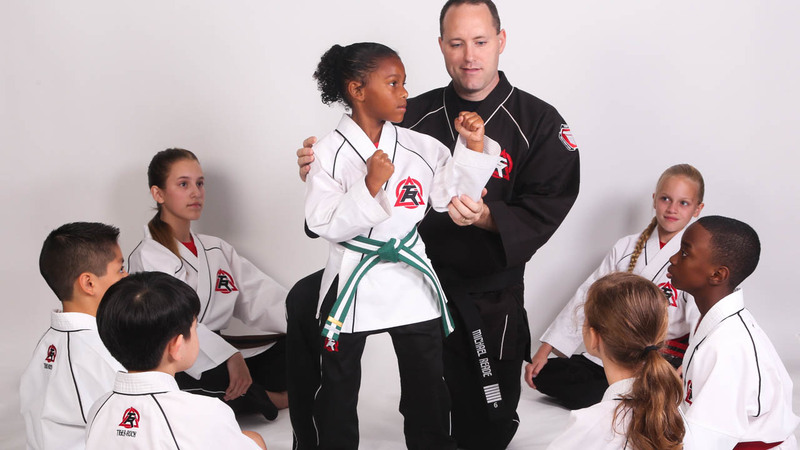 Like many other martial arts forms, taekwondo promotes honor, citizenship, humility, and respect. Moreover, taekwondo is often seen as a conduit for self-growth. We cannot tell you how many people have walked through the doors of our academy and had their lives changed thanks to taekwondo. Taekwondo forms the heart of Tiger-Rock Martial Arts of Oak Hill’s martial arts program. It is a self-defense system, competition, and a foundation of good mental and physical health. We are pleased to offer kids and adults a rewarding and powerful taekwondo class in Oak Hill and southwest Austin students. Taekwondo (stylized as TaeKwonDo or TKD) is a Korean martial art developed in the years following World War II. In fact, taekwondo is a portmanteau of three Korean words – tae (“foot”), kwon (“fist”), and do (“way”). It roughly translates to “way of the foot and fist”. Various ancient Korean and Chinese traditions, as well as the Okinawan martial art of karate, are found in taekwondo. Compared to contemporaries such as karate, kung-fu, and judo, taekwondo focuses on kicking techniques. Taekwondo students learn various head height, jumping, spinning, and sidekicks. However, striking is still a major component of this art form. Taekwondo doesn’t focus on strikes as heavily as karate does. Nor does it have a focus on throws and takedowns like judo and jiu-jitsu, respectively. As mentioned previously, taekwondo emphasizes head height kicks, jumping kicks, spinning kicks, side kicks, and striking. As such, a typical Tiger-Rock taekwondo class in Oak Hill will include kicking drills, striking drills, and speed targets. These drills will help you improve your motor skills and flexibility. 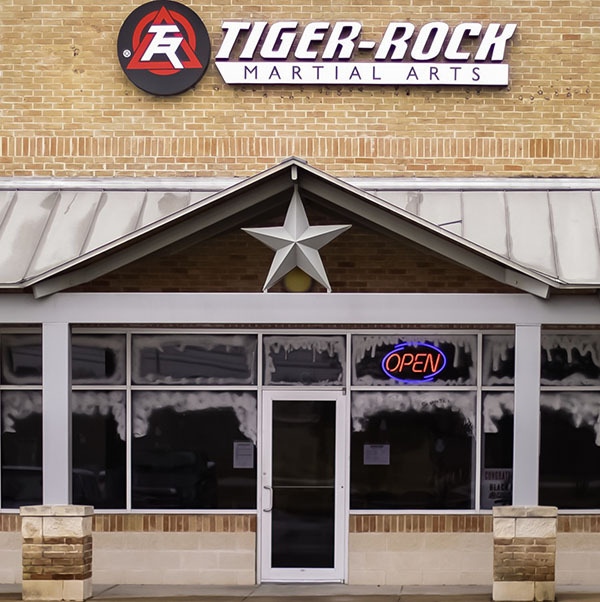 At Tiger-Rock, our classes in Oak Hill for kids and adults include taekwondo kicking drills. These drills are enhanced by striking, sparring, agility, and speed exercises. Altogether, these drills and exercises aim to build muscle and strength, improve coordination and balance, and sharpen your physical keenness. Our Taekwondo classes in Oak Hill for adults and kids are very physical. Because of this, our training emphasizes physical fitness. Therefore, we combine taekwondo with other calisthenics. As a result, your strength and conditioning improve as part of a complete workout. Taekwondo offers enormous physical fitness benefits, including improvements in cardiovascular health, athletic ability, and motor skills. As noted in a 2014 study, taekwondo athletes exhibit endurance, strength, flexibility, and anaerobic power. Moreover, taekwondo is defensive in nature; as such, much of our real-world self-defense training and counter aggression training is rooted in taekwondo. However, taekwondo is not just kicking and striking. As mentioned previously, it’s a way of life. Tiger-Rock students learn the value of honor, humility, perseverance, respect, and loyalty. Plus, students are trained to respect authority and their peers. Throughout the years, taekwondo has also developed into a competitive sport. At Tiger-Rock Martial Arts, we hold tournaments at the local, regional, and national levels throughout the United States. Tiger-Rock tournaments are exciting learning and competitive opportunities we encourage our members to take advantage of. Add a new, action-packed dimension to your life today with kids or adults taekwondo classes in Oak Hill. Start taking taekwondo training lessons at Tiger-Rock Martial Arts. Call 512-731-5425 for more information or click here to contact us. Inquire today about our programs or enroll in our Starter Course today for only $39! Fill out this form below to contact us about pricing and our class schedule!